• Brown Genuine leather band - More soft and comfortable. • Please DONOT Press Any Buttons Underwater. Also avoid the use in extreme hot or cold temperature. • If mist or droplets found inside watch surface, please contact manufacturer immediately for maintenance to prevent moisture corrosion of the internal components. Watch material:Quartz movement;Stainless steel case; black textured dial with sliver-tone hands and Roman numerals. Case size: 44mm; Band size: 22mm; quartz movement with 3-hand analog display and 3 chronograph subdials. Genuine brown leather band with tonal stitching and buckle closure. 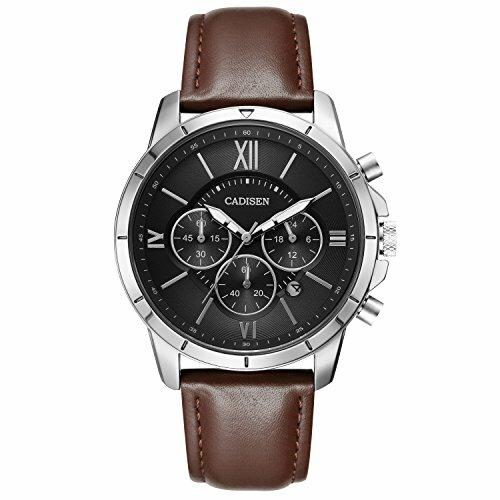 If you have any questions about this product by CADISEN, contact us by completing and submitting the form below. If you are looking for a specif part number, please include it with your message.